Thnk you once again Overstock I received my suit on today love love it just as it is in the picture. If you are looking for a suit for a Banquet, Wedding or just for Church on Sunday morning will this is the suit for you. Thanks Overstock. Dimensions 24.0 In. X 18.0 In. X 4.0 In. I ordered this suit in a size 12, my size. The jacket fitted a little snug, so I reordered it in a size 14 because I liked it that much. I will get the skirt altered to fit my size 12 hips. It is a very pretty suit....love it. I am really glad I purchased this white suit. It is very conservative, has sufficient lining, and the broach is removable. Perfect for fraternal organizations. We searched every major store for a white dress suit to meet the strict requirements of a a church organization and found the perfect suit. It is very stylishly well made, and the best value for our money. We could not be more pleased. I like the quality and price. Size runs small. Buy larger. Would recommend. Love the fit and the length for the event I attended. Nice fit, perfect for work and church. I needed a white suit for ushering at my church. I like the style and I have others of this designer. I need it for church. 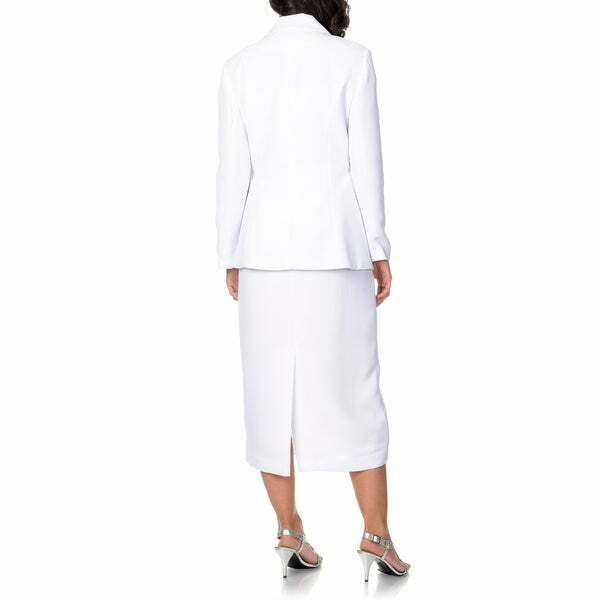 "How can I get this suit is it buy now and pay later plus size two piece suit white size 22w." Hello Marita, unfortunately size 22w is out of stock. We currently do not have inventory to check, and cannot guarantee the item will be restocked. Thank you for shopping with us.